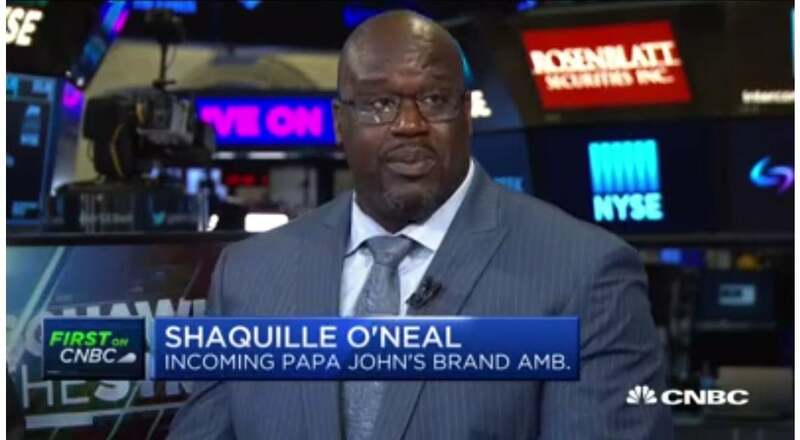 SARA EISEN: Welcome back to “Squawk on the Street.” Papa John’s Pizza announcing this morning that NBA Hall of Famer and Restaurant Investor Shaquille O'Neal will be joining Papa John's board. He will also be investing in nine restaurants in Atlanta. Shaq is also signing on as an ambassador for the company. Joining us now, Papa John’s CEO Steve Ritchie, Starboard Value CEO and Papa John’s Chairman Jeffrey Smith, and the new incoming board member and brand ambassador Shaquille O'Neal. Welcome. Good morning, gentlemen. SHAQUILLE O'NEAL: How are you? SARA EISEN: So, Shaq, you’ve got a lot going on in the restaurant business, ambassador, investor. But, I think this is your first time as a board member on a public company, is that right? SHAQUILLE O'NEAL: Yes. When I met with Jeff and Steve and talked about diversifying the leadership role and they wanted me to become the first African-American on the board. And I thought it was great, because you know, everyone loves pizza and pizza loves everyone. Papa John’s was created in ’84. I fell in love with Papa John in 1989 in Baton Rouge, Louisiana. So, you know, it is a great opportunity. You know, we want to create a culture there now where people are loved, welcomed and accepted. We don’t want to have any problems. And listen, pizza is fun. Everyone knows Shaquille O'Neal, they know that I’m in the fun business. And we want to get this thing back on track. SARA EISEN: So you guys obviously are in need of a major brand refresh. Is he going to be the face of Papa John’s now? Is his face going be on the pizza box instead of Founder John Schnatter? STEVE RITCHIE: Well, it is an exciting day, first off. I had the opportunity to meet Shaq I guess a couple months ago and the initial idea was just to become a franchisee, diversify our franchisee-base, bring in somebody that has experience as an entrepreneur, as a franchisee. And through those discussions, the aptitude and skills that he is going to bring to the board, he is going to be an ambassador for the brand. An ambassador for the brand in many ways. And you know we talk about the quality story and that part, but Shaq obviously brings the fun and the relevance and vibrance to the quality story. So, I think this is a really comprehensive way that we’ll be telling the brand story moving forward. CARL QUINTANILLA: It’s a good chance to talk about, Jeff, the difference between the marketing upside here and the operational upside. And you’ve been through those ringers before. How does it fit here, at Pizza? JEFFREY SMITH: Yeah, Carl, the pizza is great, the food is great, the quality is fantastic -- it is the best in the space. But you’re right, it is both opportunities. So, we have an opportunity to improve the operations and the marketing. Shaquille is a great partner for both of those. He is a natural leader and a natural marketer. I’ve been incredibly expressed with his creativity, but he is also an owner and operator of restaurants. So, he’s going to be a real value enhancer on the board. I’m very excited about, not only Shaquille but we’ve added five new board members in the last few months and Shaquille is going to be a great addition. CARL QUINTANILLA: Which makes me wonder: you’ve been in restaurants for a while. You’ve got Shaquille’s, you’ve been in some others. Why? It is such a hard business. What draws you to it? SHAQUILLE O'NEAL: Yeah, because I always wanted to be a franchisee. And we talked about a lot of things. So, for me, this is a triple threat: board member, franchisee and ambassador. Because again, everyone loves pizza and pizza loves everyone. SARA EISEN: You know, part of the scandal around the company’s founder had to do with the fact that he used the "N" word on a conference call. Do you think that ultimately impacted the reputation of Papa John’s in the African-American community and the sales numbers? SHAQUILLE O'NEAL: It probably did. And let me be on the record saying that is not acceptable. But now we have new leadership. And these two gentlemen, first thing when we met, first thing they talked about was you know, diversifying leadership roles. And you know, we talked about helping the African-American community. They just did a big deal with the Boys and Girls Club. So, they are really into the community. As I think about what went on, I worry about the 800 franchisees because they did nothing wrong. You know, they are your neighbors, they are my neighbors, they are regular people that do the right thing and they were very affected. We have 120,000 team members. I want to be the one to help get everybody back on track. But this is the new -- this is the new hierarchy right now. SARA EISEN: So, Jeff, what happened? Shaq contacted you guys and what did you think? How did you come to the board decision? JEFFREY SMITH: Yeah, look, this was a natural addition. We were thrilled to be able to speak with Shaquille. We met, we went out to dinner in Atlanta, we talked a lot of things including how to improve the brand, how to empower the employees, how to help the franchisees. We talked about creative marketing angles. It’s a lot of fun. You know, again, the pizza business fun. The product that we have is fantastic. Re-energizing and rebooting Papa John’s is something that we’re all extremely excited about. SARA EISEN: How much financial support, Steve, do the franchisees need right now to make that turnaround possible? STEVE RITCHIE: You know, it was a difficult year last year and I think the brand made some really smart decisions, provided a level of support to the franchisees. This year we’ve guided sales in North America negative one to negative five. Obviously, our goal is as to get back to positive sales. The quicker we can get back to positive, the less support franchisees is going need. And the addition of Shaquille I think is really going to highlight what we need to do from a marketing standpoint to get those sales moving. But it is very much a relationship collaboratively with the franchisees. CARL QUINTANILLA: Not to geek out on the metrics, but do you have valuation targets in mind once you implement some of these changes? CARL QUINTANILLA: Yeah. Be more specific. What gets you there? JEFFREY SMITH: Yeah, you know, really the focus is on same store sales and improving bottom line profitability. They both go together. We have to improve the customer value proposition, the unit economics for our franchisees. If everybody does better and we sell more pizza, it’s all going to go in the right direction. So, there is a lot of opportunity. I’m not going to put out a target today. SARA EISEN: Obviously the branding and marketing is a big part of this. Shaq, I mean, this is sort of a joke, but not really, because on Twitter everyone wants to know: Is it going to be Papa Shaq? SHAQUILLE O'NEAL: No, it’s not going to be Papa Shaq. SARA EISEN: This a company that needs a new change, doesn’t it? SHAQUILLE O'NEAL: No, it’s not going to be Papa Shaq. However, I will be introducing Shaq-Aroni. SHAQUILLE O'NEAL: Shaq-Aroni pizza: extra big-sized sausage, big extra pepperoni, extra cheese, so. SARA EISEN: Is that a branding exclusive you just gave us? SHAQUILLE O'NEAL: Yeah. You’re the first one. SARA EISEN: You’ve been making a number of menu changes actually. How is that going? SHAQUILLE O'NEAL: I like the word. CARL QUINTANILLA: We know digital is such a big piece of this, right? There must be ways to do that in a marketing sense. Tracking your order, delivery time, all that stuff, right? That is where the rubber meets the road. JEFFREY SMITH: Order delivery time is a key metric. Customer satisfaction is a key metric. And again, product quality is the biggest metric. We over index on product quality. Our product is best in the class. So, we now have to take that and significantly improve the experience and marketing and we are going to have a winning combination. CARL QUINTANILLA: Is this your top priority right now, at Starboard? JEFFREY SMITH: I am spending most of my time on this. As compared to the other investments this, is where I’m spending a lot of time. CARL QUINTANILLA: And how about you, Shaq? Is this priority number one? You’ve been in the fun business for a long time. SHAQUILLE O'NEAL: Priority number one. I’m very happy about the nine stores that I will be obtaining in the Atlanta market. I’m very happy about partnering up with Papa John’s. And I’m also very happy about helping these guys create a culture where everybody is loved, welcomed and respected. SARA EISEN: Jeff, you’ve done a lot of turnarounds and fixes in your career. Where does Papa John’s fit in, in terms of how challenging this one is going to be? JEFFREY SMITH: Yeah, you know, it is a little different, right? Because we’re used to getting involved in companies that need operational improvements. That is the same. So Papa John’s can improve operationally. This one is different because we also have to move past a marketing challenge, an image challenge. But I think that we can handle that well and we’re going to break through that challenge and I think this is a big part of breaking through that challenge. So, this actually in terms of the operations complexity is on the simpler side. But I’m not going to say it is easy, I’m not going say it will be a quick fix. But it is something that we get our arms around and understand how to improve. SARA EISEN: Okay, Steve, what are you telling investors right now, as far as a timeline? And a lot of the analysts notes are still pretty skeptical, given the trajectory of sales. STEVE RITCHIE: Yeah, I mean, with that said, it’s going to take some time. But I think we continue to do the right things in terms of the brand sentiment thesis. So a lot of the culture challenges that have been represented externally, internally working on diversifying the leadership team, a lot of the things that we are doing from the people side. But the next big step is really talking about why people enjoy the brand, and that’s our pizza, that is our products. They are great products. Having Shaquille joining the board here, new thinking, new ideas. I really think this is a turning point year for the brand. But really it’s the first half of the year is going to be a challenge. We did report our January numbers, they were down. But we think the back half of the year is going to really create momentum to start getting back to growth, you know, for Papa John’s. CARL QUINTANILLA: Shaq, you can open a lot of doors I would assume with officials in virtually every major sports league. Should we look for new partnerships, new sponsorships? SHAQUILLE O'NEAL: That is something that we’ll be talking about. We’ll be talking about a lot of new innovative things. I just want people to understand that image is reality. And the reality is we have new leadership and I’m confident these guys will bring Papa John’s back to where it used to be. And you know, we just want to promote fun, we want promote great healthy ingredients like we’ve always been doing and I’ve been involved with Papa John’s since 1989. So, I’m happy to be here. SARA EISEN: As a customer you mean? SHAQUILLE O'NEAL: As a customer, yes. SARA EISEN: But you’ve been in so many other restaurants. Five Guy’s, and Auntie Anne’s. What have you learned from some of these food investments and partnerships? SHAQUILLE O'NEAL: Well I learned, being a franchisee, being a manager, the one thing I never did was micromanage my people. And I know and understand customer service. If the customer is not happy, they don’t like the food, we’re not doing something right. So I always try to focus on customer service, what the people like, what the people want. And if you do that, and you still put out a great product, everything should go like you want to go. CARL QUINTANILLA: Can I just ask you, I mean you are here at the New York Stock Exchange, where thousands of companies, stocks, trade. What do you own? What do you like? Do you trade any? SHAQUILLE O'NEAL: I do, but I would get trouble if I start talking about what I trade. SARA EISEN: I mean, you bought into Google, right? SHAQUILLE O'NEAL: Yeah, mm said ‘Keep to yourself,’ because the way it was portrayed on TV, like I was showing off. So, to answer your question, I’m in. I’m always in. SHAQUILLE O'NEAL: Whatever you got, I got. Put it that way. CARL QUINTANILLA: My last fun one is: your gif of you dancing, I think it was Gold Bond, has to be the most gif’ed gif of all time. When you see that, does it make you laugh? SHAQUILLE O'NEAL: It does because it is all about fun. I realize that if you make people laugh, it releases endorphins in their face and hopefully what that does is relieve stress. When you think of Shaquille O'Neal, I want you to think of a nice guy ,a funny guy that makes me laugh. As I look at everybody here, this is a real job, a stressful job. I want to be the one guy to make you laugh and make you forget about all your stressors so you can enjoy your day. 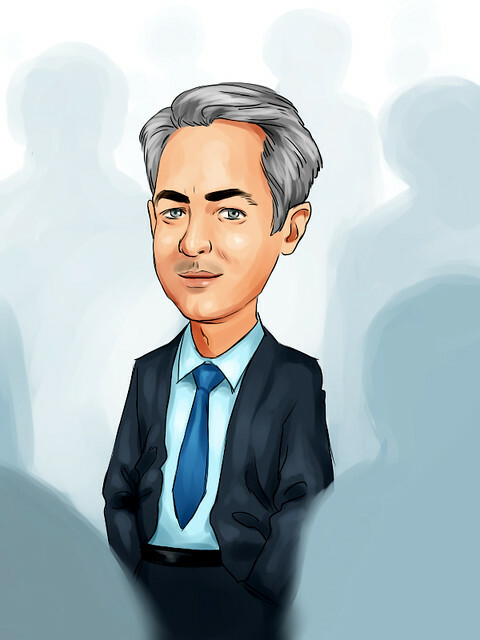 SARA EISEN: Maybe one of those stocks you are in-- maybe Jeff has got you into Bristol-Myers? Jeff, which we should talk about now. Last time you were on with David, you weren’t able to. You’ve been pretty public now. JEFFREY SMITH: Knew it was coming. SARA EISEN: Did you think we weren’t going to go there? What makes you think that investors and shareholders here will side with you ahead of this vote against the deal? JEFFREY SMITH: Right. 200 pages. We met with ISS. We met with Glass Lewis. There is a couple of key points here. First, Bristol-Myers is a great company standalone. It is a growing business. It doesn’t need to do anything. There is some fear out there that if Bristol-Myers doesn’t buy Celgene, then what is next? What is next is you have a great company with a lot of options to expand its business. It is a growing business standalone, it’s an extremely profitable business, it has no debt standalone, about produce $37 billion of cash over the next couple of years. There is a lot of flexibilities. They don’t need to do any deal and they certainly don’t need to do this deal. As it relates Celgene deal, we just think it is too risky. They are paying a very large price which includes, when you break down the numbers, about 30 billion for the pipeline. And in order to make that work, based on our presentation, that means that Celgene needs to be successful with coming out with about ten new blockbuster drugs in the next eight years. That is just really difficult for us to imagine actually happening. Drugs are very difficult to predict. What was it -- yesterday we had one that didn’t make it. But people are excited about drugs coming out people believe they will work. People are optimistic. We all are as individuals excited about drugs coming out and hope they work for the benefit of all of us as people. But sometimes they don’t. And buying into Celgene because you believe that ten blockbuster – blockbuster, not just ten drugs, but ten blockbusters will come out in the eight years is a lot of risk. You start missing one or two even, you could be destroying billions of dollars in value and Celgene over the last 15 years came out with three blockbuster drugs. SARA EISEN: Have you ever been short Celgene? JEFFREY SMITH: We are not short Celgene. We don’t talk about our trade -- I can’t talk about what we’re doing for years and years and years. We are not short Celgene. We’re not advocating on that side. But we are Bristol-Myers shareholders and looking out for what’s in the best interest of Bristol-Myers. SARA EISEN: And just one more: on the whole Bristol-Myers can stand on its own, which is a big part of your thesis here, I mean, you bought into the stock, right, after the deal or around the deal. So, some are wondering whether you really believe and have the confidence that it has the pipeline to exist on its own. JEFFREY SMITH: We do. We did a lot of work. So, yes, we bought in, but we bought this because of two things. One, lots and lots of institutional shareholders were calling us because they were so upset about the deal. They hated the deal, they didn’t want the deal, they were asking for help, they were asking for us as an activist to get involved. And two, we went in and then did a lot of research because we didn’t need to get involved. We got involved because we truly believe that the deal did not make sense. If the deal made sense, we could have stayed away. We didn’t need to do this. But after we dug in, it became pretty obvious to us that this deal may be being done for the wrong reasons and that it could destroy a lot of value without enough upside. So, the reward is just not worth the risk in our opinion as it relates to this transaction. So, Bristol-Myers shareholders if they are worried about their investment in Bristol-Myers and they want to make sure they are derisking their investment, they should stay with Bristol-Myers. They don’t need to do this transaction. SARA EISEN: We’ll see how the proxy advisors weigh in. I guess that is the next biggie ahead of this April 12 vote. Thanks for commenting on it. JEFFREY SMITH: Thanks for having us on. CARL QUINTANILLA: I said restaurants are hard. Pharma is harder. JEFFREY SMITH: Pharma can be difficult. It’s hard to predict drugs. Yes. SARA EISEN: What about basketball, Shaq? Zion Williamson plays his first playoff game today. Everybody says that he is the most physically dominant player since Shaquille O'Neal. Is that true? SHAQUILLE O'NEAL: He is a great young player. Very gifted. I wish him well. There’s a lot of speculation that he may leave school after this to join the NBA. My advice to him is take as much time as you want. Have fun. Especially in college. This will be the best years of your life. Once you become a professional, it is a different ball game. You have to learn words and terms that you know nothing about. Like the first word to me was FICA. FICA, yeah. Because I got a check for $1 million and FICA took so much money I had to ask my guy like ‘Excuse me, brother, who is FICA?’ So Zion, watch out for FICA. He’s coming for your money. SARA EISEN: Did you ever blow out a shoe? SARA EISEN: What did you think when you saw that? I know that you’ve been a long time Reebok guy. SHAQUILLE O'NEAL: I saw that and I was saying to myself he’s a very powerful guy. Nike – they’ve always been at the top. I don’t want to talk about the Nike brand. My thoughts are this guy is very powerful because he was using with all that force and when he stopped, he kept going and he just ripped the shoe. SARA EISEN: Would he have given young Shaq a run for his money? SHAQUILLE O'NEAL: Never. Stop it. SARA EISEN: This was fun. Shaquille O’Neal, thank you. Jeff Smith, thank you very much. Steve Ritchie, thanks to you as well. CEO, Chairman, and new ambassador, investor and board member of Papa John’s.